My gardener has started bringing peppers into the kitchen. Yesterday’s harvest included Pablanos. We used them to make chili rellenos. If you want the recipe, I’ll be happy to share. Just ask. For now I want you to know that had the gardener opted to leave the peppers on the bush, they would have turned from a bright green to red. 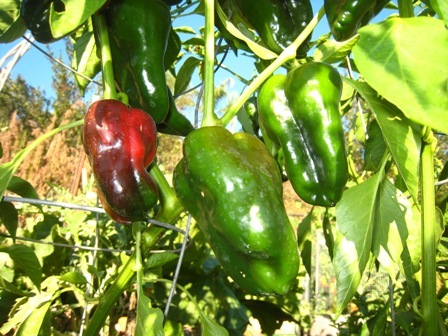 The red chilies are hotter and more flavorful than the green stage. Dried Pablano chilies are known as Ancho chilies. The powder from ground Anchos makes a great seasoning.